The English Graham watch company was founded by a watchmaker George Graham who introduced many innovations in watchmaking. He invented the chronograph, the dead-beat cylinder escapement, the mercury pendulum, made to compensate temperature differences. He also created the watch for the Greenwich Royal Observatory, that had been setting the world's time for the most part of the 18th century. Graham watch company was restored in 1995 and is nowadays a privately owned Anglo-Swiss watch company, producing its watches in the Swiss watchmaking centre – La Chaux-de-Fonds. Graham brand will be the official timekeeper of the 2012 RBS 6 Nations Championship for the fourth consecutive year. 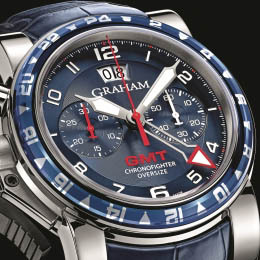 In connection with this fact Graham provides all the tournament's referees with its dedicated chronographs. The Chronofighter Oversize Referee watch is a non-compromised chronograph, fully corresponding with the rough and rigorous atmosphere of the rugby championship. This year the company will become the tournament's official timekeeper for the fourth consecutive time, continuing the long-term partnership with the prestigious rugby championship, with the 6 best rugby nations from the northern hemisphere participating. The RBS 6 Nations Championship with rich traditions and heritage is a noble tournament, that survived till present day. Its principles correspond with the values of bravery and passion, thanks to which Graham timepieces are produced. As the championship's official timekeeper the company supplies its chronographs to all referees to help them fulfill their duties with the highest precision possible. Everything in the Chronofighter Oversize Referee chronograph is dedicated to the RBS 6 Nations Championship, as it was designed to radiate the spirit of the tournament. The colours of all 6 teams are reflected on the seconds counter, placed at the “3” position. The official logo of the championship is applied on the watch's case back. The purely men's Chronofighter Oversize Referee watch was elaborated considering referees' needs. Provided that the referees will wear the watches during all matches, Graham has designed a special lightweight titanium case with rubber inserts. The watch is easy to wear and very sustainable. Easy data reading is vital for referees, that's why the watch company's craftsmen opted for a white dial, emphasizing the 30-minute counter with a double scale calibration, placed at the “6” position. The watch is driven by the modified Valgrange movement with 3 counters. The minute counter has the inner calibration of 40-minute periods, splitting a match evenly into 2 half-times. Referees can control the match time, at the same time controlling the situation in the field. For the movement's smoother operation the company's watchmakers used the left drive lever mechanism for the first time in its long history. Controlling the chronograph is so intuitive, that you don't even have to look at it: all its functions are under your thumb's full control. This year the watch is supplied with a hypoallergenic rubber strap, embodying British elegance even in the field. The chronograph's main features include: a round light titanium case with the diameter of 47 mm, tri-compax automatic chronograph, the G1735 caliber, 25-jeweled, frequency – 28800 half-oscillations per hour, the Incabloc shock resistance system, 48-hour power reserve, a domed sapphire crystal with double antireflective coating, a transparent case back of sapphire crystal with the RBS 6 Nations Championship logo, a blue rubber strap. In addition you can add, that this model combines precision, readability and advanced materials, which prove its champion status. We are now looking forward to the moment, when it'll be possible to see the first seconds of the game on Chronofighter Oversize Referee chronographs' dials.